The Dreamlink T2 hasn’t been around for too long, but it’s already making headlines. If sources are to be believed, Dreamlink T2 has raised the bar and set new standards for streaming entertainment. So, is it really the best streaming device? Let’s find out through this review. To begin with, let’s figure out what this IPTV Android box can do. The Dreamlink T2 is a full-fledged IPTV Android box that changes the way people watch TV. It’s a robust content delivery platform that can offer local, premium, as well as International TV channels. The beauty of this device is that you can use it to stream content from IPTV services. You can also run Netflix, Kodi, and everything else. So, it can offer you all the movie channels, sports packages, news, pay-per-views, TV shows, kids programs, and much more. Simply put, it’s a complete entertainment system on its own without the high price tag attached to it. Formuler, the parent company of Dreamlink, has since released the slightly improved Formuler Z7+. Check out our review to find out if it is worth the upgrade. It runs on a recent Android version, so you are literally getting the best in the class quality. Equipped with the latest decoding specs and Android 7 Nougat at its heart, the Dreamlink T2 has been designed to offer limitless media streaming enjoyment for years to come through various IPTV services and the latest Kodi version. Better yet, there have been several other noticeable upgrades over the Dreamlink T1 Plus device. In other words, it keeps getting better and better. Let’s dig into the product features to know more about this IPTV Android box. The product by itself is pretty lightweight. But, it’s not one of those flimsy units out there that will crumble like a pack of cards. Believe it or not, the device can easily fit into the palms of most hands. Simply put, it’s a compact and well-built unit, which is housed in a small rectangular box. Its simple design makes it easy to use, and it delivers amazing sound quality with crisp images. Given the small dimension, you will be able to easily transport this unit even if you haven’t lifted a dumbbell in your entire life. Talking about the impressive specs, you can expect HDMI audio/video output. It makes use of a Hisillicon quad-core processor, and the storage capacity is 8 GB. The SDRAM is 1 GBytes (DDR4). The max resolution is 2160p 24Hz, and it supports Ethernet, HDMI, USB, and Wi-Fi media input connectivity. Dreamlink T2 is also 4k and UHD ready. The external USB supports live recording or playback. It also helps with time shift. It features a Micro SD Card slot too. Given the specs, it would be safe to say that the device features enough space, power, speed, and memory to run Kodi and other apps like a breeze. With the help of the SD card reader and USB port, recording and making use of time shift functionality won’t be impacted by the limited 8 GBytes device storage. And, there’s more to this little TV box. This device is artificial intelligence at its best. No kidding! This device learns how you watch TV. It learns how you use the device on a day-to-day basis, and it does it for you over a period of time once it gets a good grasp of your habits. Frankly speaking, it can’t really get any better than this. Be it Dreamlink T1 or any other IPTV box out there; it lags this artificial intelligence. The Dreamlink T2 really scoops it out in this area like a major winner. Without a doubt, this is arguably the best streaming device that can put most of its competitors to shame. It includes almost all the popular streaming content apps out there on the market today. Furthermore, the device features a ‘Catch Up TV’ function, which allows one to go back and play the shows that one might have missed in the past. One can also fast forward, stop, and rewind the video to control what they want to see on their TV. So, one won’t miss out on anything, and one will be able to watch things at their own convenience. Finally, Dreamlink’s set-top boxes have always been favored over Infomir’s MAG devices due to their fantastic electronic program guide [EPG]. It looks great and provides the best overall experience. Dreamlink T1 is only a year old, and the Dreamlink T2 has set its way into the market, which was a surprising move by the company considering the fact that Dreamlink T1 had already gained a good foothold in the market. So, the expectations from Dreamlink T2 have been high ever since the day of its inception. 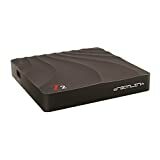 The Dreamlink T2 contains the following items; the Dreamlink T2 Plus itself, power supply, HDMI cable, power plug, external Wi-Fi Antenna, and a remote control. Remember, some of the competing products do not include an HDMI cable hoping that customers will have one lying around in their house. But, Dreamlink T2 throws all the guesswork out of the window by including an HDMI cable in the package. It’s good because it can be rather annoying when you don’t have all the components at arm’s reach while trying to use the device for the first time. Oh, we almost forgot! A user manual is also thrown in so that you can run the device instead of the device running you. The learning remote looks and feels good, and it’s easy to use as well. 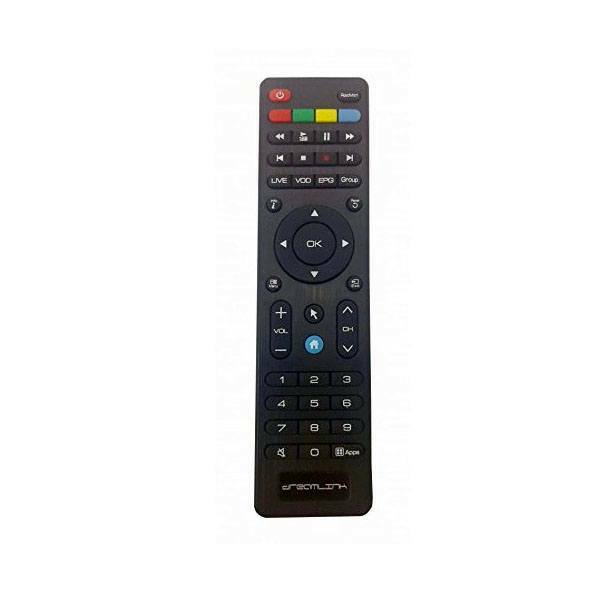 Unlike other inferior remotes, you won’t have to click the buttons multiple times to get a response. The remote sensor on the Dreamlink T2 unit receives signals from the remote like a charm. The Dreamlink T1 remote had a tad bit activation delay, which is not the case with Dreamlink T2 remote. The remote wakes up immediately and gets to work as soon as you press the buttons. But, here’s the catch. The controllers power themselves off in order to save the battery power. So, you would experience a bit of a delay in response if it’s sitting idle for too long. This isn’t to say that you will die of old age waiting for the remote to respond, but expect a tad bit delay if you are using it after a long break. The Android 7 Nougat OS really sets it apart from the crowd. The interface is ultra-fast, to say the least. Launching apps, playing, or browsing content is a quick affair on the Dreamlink T2 platform. By all means, it’s much faster and responsive than Dreamlink T1 Plus device. Also, getting started with this unit is easier than slicing bread. After unboxing, you just have to follow the instructions on the screen, and you should be good to go. It’s plug-and-play for the most part. Better yet, you will witness 4k streaming at its finest with this device. The HDR picture quality could be the best that you have ever witnessed until now. Better yet, this streamer is an economical competition to the high-end products in its class. So, you won’t have to empty your wallet to bring home this gem. Believe it or not, the company can easily get away by charging a tad bit more for this device. Given the product specs, usability, and usefulness, they wouldn’t experience a backlash for a rise in price. Fortunately, the price is very reasonable. So, most people will be able to afford this unit without pawning their wife’s jewelry. Compared to Dreamlink T1, it offers a wide variety of audio and video formats, which is welcoming news for all the avid fans out there. Also, they have added an array of new channels. Furthermore, the Dreamlink T2 unit is set for auto-update. Therefore, it will update itself whenever there’s a software upgrade. So, any upgrade will be easily applied because you won’t even have to lift a finger to incorporate the new changes. Above all, it’s compliant with almost all types of Stalker servers. For the features, the product is reasonably priced. In fact, it won’t be an understatement to claim that it’s worth every solitary penny spent on it. 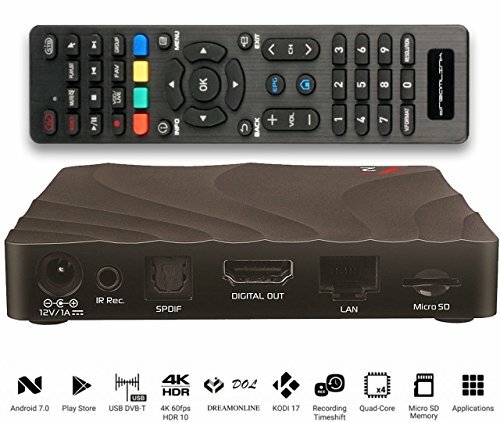 It’s easily the most optimized Android IPTV box by Dreamlink since you will not only be able to watch thousands of TV channels, but you will also have access to all the latest Android apps with the Android 7 operating system. Better yet, one-year manufacturing warranty is an integral part of the deal. Whether you have a soft spot for Dreamlink or not, the Dreamlink T2 is built to give you feelings of being on cloud nine. We hate to be the messenger of the bad news, but we have to cover the negative aspects of the product too. As they say, no product is 100% perfect at all times. And, this little device is no exception to this rule. Unwillingly, we have to do the moaning and hankering part too. The product does introduce you to occasional glitches. So, you might be required to restart the unit to fix certain apps that might not work. Frankly speaking, this is a common issue with all the products in this niche. Moreover, such instances are quite rare. But, it is worth mentioning in our Dreamlink T2 review. However, given that this product is still very new, we are confident that Dreamlink will continue to improve the T2 and push updates to the devices. Also, the product is loaded with a ton of features. So, it will take some time to master everything. As you keep using the device, you will keep discovering some of its features. Basically, don’t expect to know and learn everything from ‘DAY ONE.’ Be willing to give the unit some time, and it might keep surprising you every now and then. This may not necessarily be a bad thing, but some learning curve is involved over here. The Dreamlink T2 only comes with 1 GByte of RAM and 8 GByte of internal memory. Internal memory is not a huge issue since you can expand this with an SD card or USB drives. However, we would have liked to see 2 GByte RAM on this device to ensure it runs fast even with multiple apps running at the same time over a long period. For now, we haven’t noticed any speed issues, but it is something to keep in mind. In our opinion, the product drawbacks are minor. They are not something that will leave a bad taste about the product. Moreover, the pros of this Android IPTV box clearly outweigh the cons. Therefore, the minor drawbacks can be overlooked for the most part. Also, the majority of the reviews about the Dreamlink T2 have been positive. Of course, we could all wish that it was cheaper than its current price, but cheaper units cut corners. They are nowhere close to the Dreamlink T2 unit in terms of performance, usability, durability, and usefulness. Despite the minor hiccups, Dreamlink T2 won’t leave you disappointed. By all means, this is no BS streamer. In the prevailing scenario, it’s the best streaming device in its class. Of course, the technological growth in this space has been astronomical. So, it won’t be a surprise to see a new arrival with better specs in the years to come. Until then, this amazing device has everything in it to please you till death. Frankly speaking, there is no IPTV Android box like this on the market today. It’s a little device that can deliver a big punch. If you are in the market looking for a new IPTV Android box, it can’t really get any better than this next generation device. Given the great quality, added features, and superior performance, it’s a no-brainer choice to pull the trigger on the Dreamlink T2. In a nutshell, it’s an amazing device with strong specifications that has been answering the needs of global customers like nothing else in the market. It has all the futuristic requirements of a high-end Android TV box. So, it will please you for several years and beyond without any major hiccups. Truthfully speaking, it could easily be the favorite electronic device in your house.